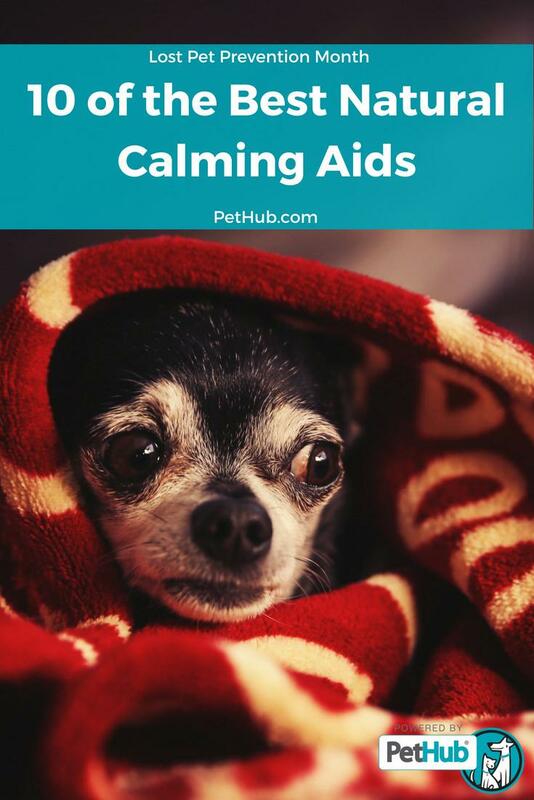 If your pet suffers from fear, phobia, or any one of the several types of anxiety, you may wonder what you can do to help calm an anxious dog. There are many different calming products that can help relieve the stress & anxiety that our pets can experience. Everything from wearables to audio & visual stimulation to treats & supplements. These natural remedies are a safe alternative to prescription medications. We have done the research for you and found 10 of the best natural remedies on the market for your anxious dog. Not all dogs are okay with wearing shirts or collars to calm them, so it can be nice to have a form of anxiety relief that all pets can enjoy. These calming chews help to support relaxation & balanced behavior in pets. The chews contain Ginger to help settle the stomach, Chamomile & L-Theanine to help promote relaxation and restful sleep, and L-Tryptophan, which is converted to serotonin (the happiness neurotransmitter in our brains) once absorbed. Dogs that suffer from separation anxiety miss their person when they are left alone even for a short time. This makes them anxious and nervous. Your dog loves your scent, because they associate it with your presence, so leaving something of you behind when you leave can help. The Comfort Cuddler has a pouch that opens up where you can stuff an item of clothing that smells like you inside. It then becomes a pillow for your pooch that they can cuddle up to, and be relaxed & comforted with your scent. One of the biggest products & additives on the market for pets right now is CBD & hemp oils. But what exactly are they and how can they help your anxious pet? Simply put, CBD acts as a 5HT1A (a very important serotonin receptor) agonist, which in turn helps our brain transmit more serotonin, reducing stress and improving our overall mood & function. Pet Releaf offers some of the highest quality CBD Hemp Oil on the market for pets. During scary & stressful times like storms or fireworks, or even when you leave for work, it can really help your four legged friends to have a safe space they can retreat to. The ZenCrate provides that in a way no other company has. The ZenCrate works by playing soothing music & creating a gentle air flow once it detects your pet inside. When your pet is calm and exits the crate, it automatically turns off. When your pet gets anxious or scared, a lot of times talking to them or keeping them entertained can help to ease those nervous nillys. This is because dogs often times react positively to the right kinds of audio & visual stimulation. DogTV has created a one-stop-shop full of programming for dogs. All of the content they provide is scientifically developed to provide the right type of stimulation for your dog in different scenarios. The result is a happier, calmer, less stressed pup. Not all dogs experience anxiety while just at home, so wouldn’t it be nice to have a portable form of comfort for your dog when you go on road trips or they are staying with someone else? Pet Acoustics has developed Pet Tunes, a portable speaker pre-loaded with frequency modified music that has been clinically proven to help reduce stress & anxiety in dogs. This rechargeable speaker is small and can be taken anywhere with your pup to help keep them happy anywhere life may take them. Dogs are pack animals, and they are instinctively drawn to stick with their “pack”. This is why they become so attached to their owners; you are their new pack once they leave their mom & siblings. The Snuggle Puppy plays to those instincts by recreating that pack intimacy with a real-feel heartbeat & warmth. Your dog can cuddle up to the Snuggle Puppy in times of loneliness or fear, and feel the comfort of a “real” companion. Earth Heart essential oil remedies for dogs come in different options to fit your lifestyle and pet's needs. Canine Calm with lavender creates a serene experience for you and your dog. Available in spray mists, wipes, oil diffuser blend and roll-on, this special formula of essential oils helps dogs stay calm during thunderstorms, fireworks, boarding, grooming, training and competition, adoptions, holidays, bath time, crating, separation, hospice and clinic visits. Sometimes when our pets get anxious or scared, they want to be in our laps and held by us. The Surgi Snuggly Anxiety Buster is a full body suit that applies constant gentle pressure to your pet to help calm them. This works by manually stimulating their parasympathetic nervous system, which can help slow their heart rate & bring them to a calmer and more relaxed state. There are many different types of stimulation that can help to calm our furry family members when they are stressed or anxious. Many products utilize just one of these, but combining several can be even more effective. Calmz has found a way to incorporate audio stimulation, gentle pressure, and acupressure points into their product. 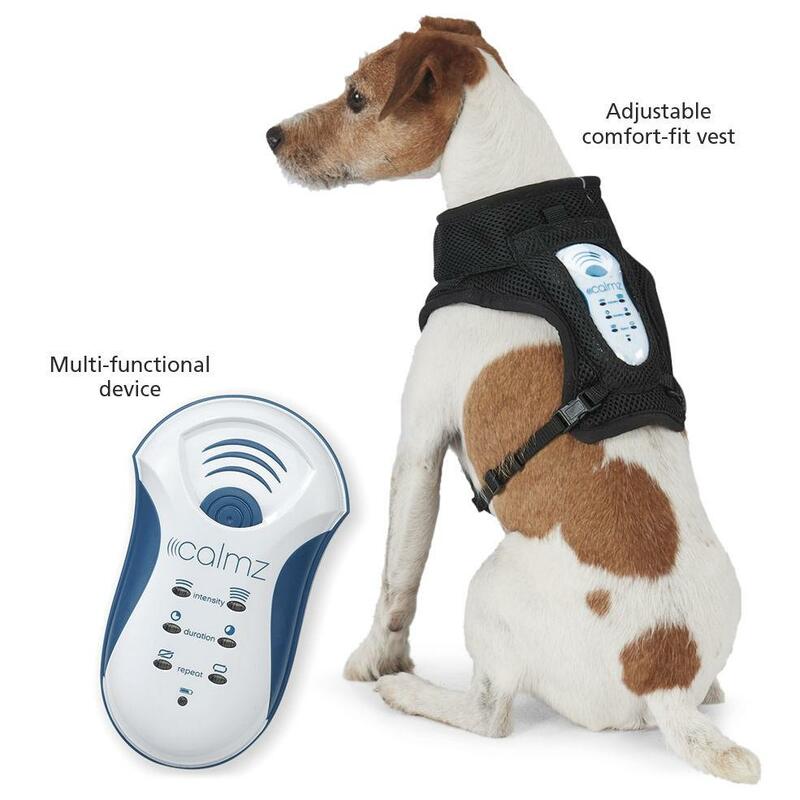 The Calmz Anxiety Relief system has an adjustable vest that fits your dog and cradles a device over certain acupressure spots on your dog. It then plays therapeutic music accompanied by relaxing vibrations to calm & comfort your pet. Using one of these natural, non-pharmaceutical remedies, or several in combination, can help your anxious pet enjoy life more.